A Jack of all trades, trying to master some . . . The rhubarb leaf stepping stones worked out very well. My friend across the street (who has been losing his leaves to my projects) had a fairly large leaf, because I had left his patch alone for a while. One look told me that it was a nice leaf to make a bird bath with. I had been watering my newly seeded lawn twice a day for a few days and every time I did this , a robin came by and hopped though the spray from my hose. Seeing that planted a seed, because I saw the need. The robin was trying to tell me something. The procedure is quite simple.Take a piece of plywood and lay it on a level surface. Put a piece of very thin plastic ( you could use a garbage bag) over the board. 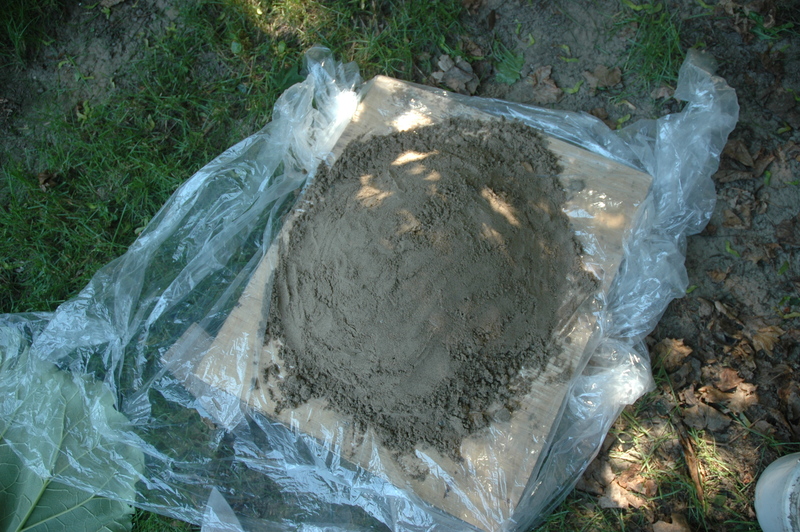 Make a mound with moist sand the shape of the leaf on the plastic sheet on the board. Place the leaf on top of this mound. It should be a nice natural fit. Put a layer of concrete about an inch thick over the entire leaf. Place some wire or wire mesh over the concrete for added strength. Remember to pat down the concrete so you get the air bubbles out. Lift up the plastic around the edge: shape and pat the edges so that you have a relatively smooth and thick edge that will be strong enough to avoid breakage. 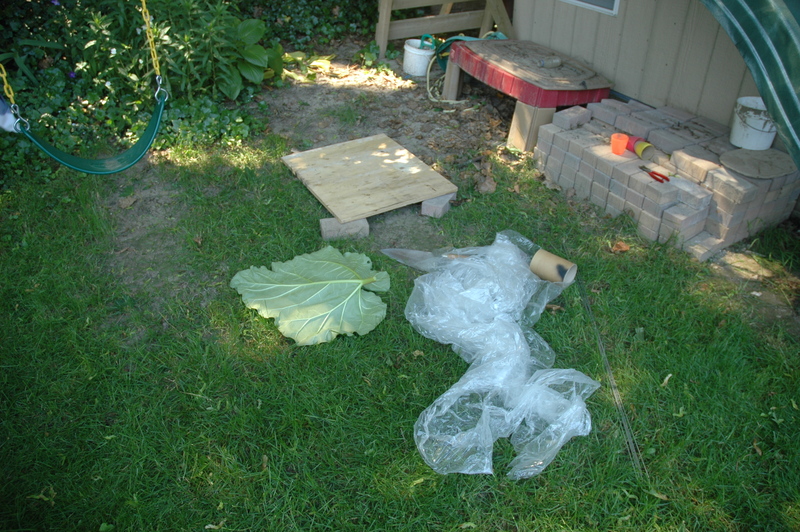 Bird bath materials laid out. Beginning to make the mold. The mold is ready for the leaf. For better results put the plastic on top of the sand and then place the leaf on the mold. Leaf ready to have concrete applied. Sorry, no pictures of the cement process. I mixed two batches with different dyes. This produced the mottled appearance. 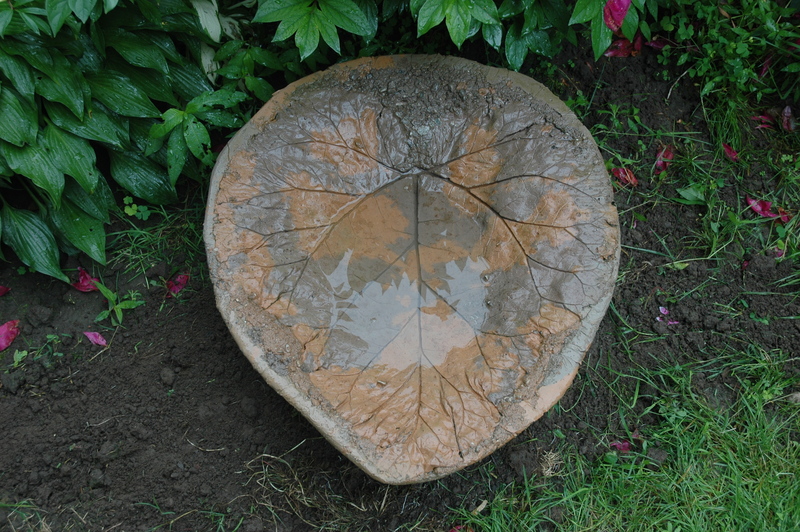 The finished bird bath installed in my garden. Within minutes of installing the bird bath, a bird was flying overhead, checking it out. You can see its reflection in the water. This project is definitely for the birds. 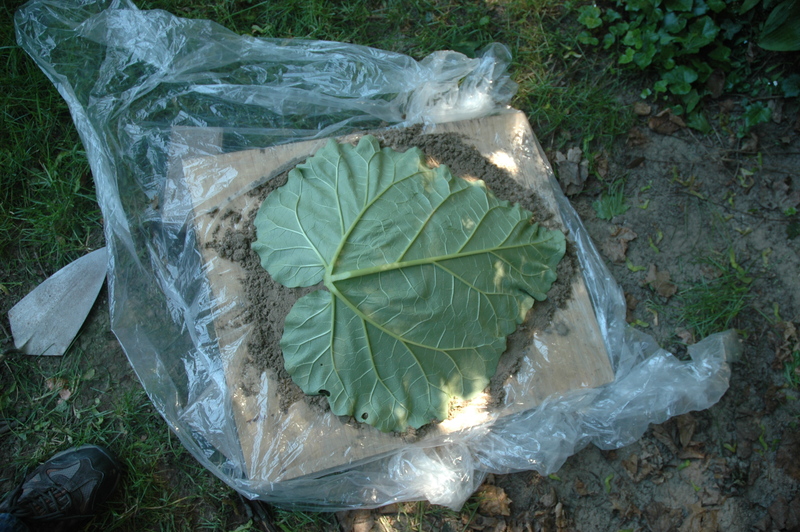 After completing my birdbath, I found the following article and videos for making a rhubarb leaf bird bath in a sample issue of GardenGate magazine. 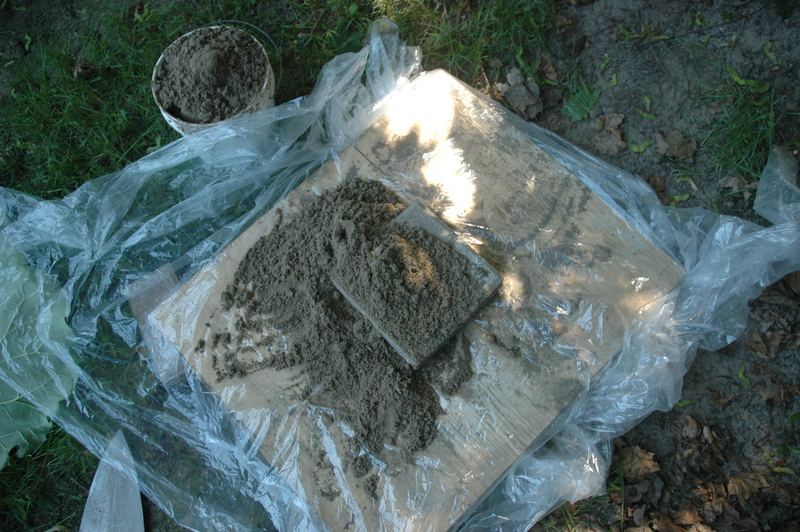 The author used a latex patch concrete, while I used regular premixed concrete, which has a bigger aggregate in it. Written instructions on how to sand cast a bird bath. Videos on how to sand cast a bird bath. Wow, what a neat project. I may have to (get my husband to) try this. The birdbath looks great! I love the mottled look , will have to try that. I love the mottled look. Do you think paint would be ok to use for this. Do you like the bigger aggregate in the concrete instead of the vinyl? I don’t know how well paint would work. The dye works very well and stands the test of time. You can buy it at any of the big box stores that sell building materials. I would use water based paints and give that a try if you are curious. I think the smaller aggregate works better on such a small pour. Not sure I know what you mean by using vinyl. I think Joan means that in the Garden Gate article you reference, they like to use vinyl patch concrete, while you use something else (portland cement?). You can follow me as I jump from project to project.